Summary: Luxury stairmill from Star Trac – this is like having a moving staircase of your own. 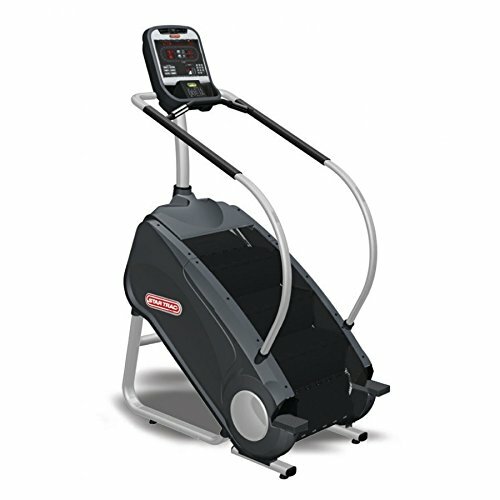 Sure, it is not cheap – though for those who enjoy stepping / stair climbing activity and want the best possible equipment, the Trac E-ST from Star could be the perfect fit. Check out this amazing machine on this product page at amazon.co.uk now! Challenge yourself with Famous Steps® which includes famous landmarks like the Empire State Building. Utilizing an adjustable resistance system, the difficulty of the workout can be easily adjusted over 20 levels to achieve the result you wish. It’s always recommended that you start slow, no matter how fit you may be, and work your way up the difficulty levels, thankfully, the process is very simple and is all available from the LED console situated at eye level. Accessing it is easy and won’t interrupt your workout because of the tactile response keypad. This LED console offers even more, training programs and workout information is also displayed. Workout programmes act as your own personal trainer, guiding you on what to do to focus on a specific problem area: programs such as the Thigh and Glute Sculptor program help tone your thighs while the Famous Steps program simulates climbing your favorite landmarks. It is important to take note of your progress, and the console shows you the distance you’ve covered, time taken, heart rate and calories burned. To make the workout a little more fun, an entertainment system is available to play your music, say from your iPod, through the speakers. However, working this piece of equipment within the home can be challenging because it’s quite heavy, 161kg, which means finding it a permanent position, bad news for someone with little room.